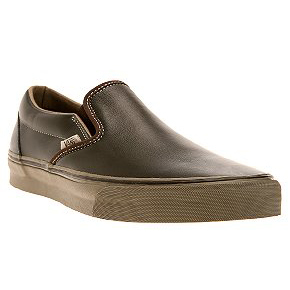 Vans are so amaz­ing­ly ver­sa­tile. 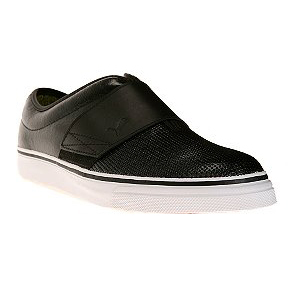 Sure, they’ve been the stan­dard skate shoes for eons now, but they can also dress up with­out break­ing a sweat. The per­fect exam­ple of that is this mod­el, in soft leather with tonal gor­ing on the sides, con­trast stitch­ing and logo tag, with a hearty neu­tral sole that exudes not only easy com­fort but casu­al style that can hit the opera and skate on home with­out los­ing fash­ion points or street cred. Import­ed. Spot clean. Named after the famed art deco the­ater in Los Ange­les, the El Ray from Puma is sleek and slick, a slip-on with style to spare. Pearl­ized leather uppers with per­fo­rat­ed toe-box; wide leather strap with elas­tic gor­ing; con­trast lin­ing; striped mid­sole; gum rub­ber sole. Import­ed. Spot clean. Named after the famed art deco the­ater in Los Ange­les, the El Ray from Puma is sleek and slick, a slip-on with style to spare. Tex­tured can­vas uppers; wide coat­ed strap with elas­tic gor­ing; con­trast lin­ing; striped mid­sole; gum rub­ber sole. Import­ed. Spot clean. 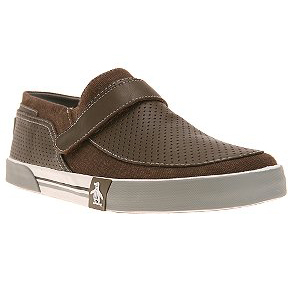 Clean slip-on sneak­ers from Pen­guin, with brown can­vas and per­fo­rat­ed leather uppers. Elas­tic gor­ing at the sides, with leather sta­bil­i­ty strap; striped mid­sole with logo detail­ing; tex­tured rub­ber sole; logo patch at the heel. Import­ed. Spot clean. 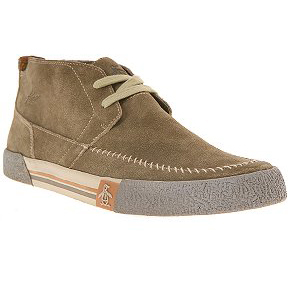 Pre­mi­um Chuk­ka boot from Pen­guin, with rich pieced suede uppers and stitched moc-toe detail­ing. 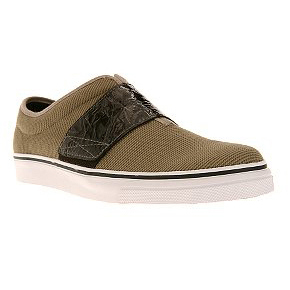 Striped mid­sole with logo detail­ing; tonal laces; tex­tured rub­ber sole; embossed logos at the tongue and side. Import­ed. Spot clean. Hot Court Force high top from Nike, inspired by the clas­sic Air Max 95. 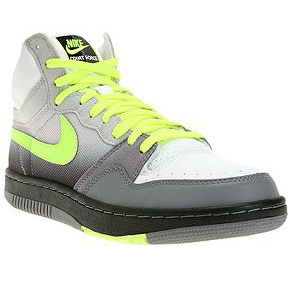 Nylon and leather uppers with grey fade; con­trast neon laces and swoosh; black mid­sole; tex­tured rub­ber sole. Import­ed. Spot clean.